A guide detailing resources for researching the Anthracite Coal Mining Region of Northeastern Pennsylvania. 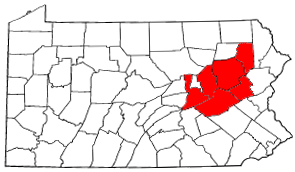 The Anthracite Coal Region of Northeastern Pennsylvania encompasses six counties in Pennsylvania: Carbon, Columbia, Lackawanna, Luzerne, Northumberland, and Schuylkill (a small portion of Dauphin County also contained coal). This region contains the only reserves of United States’ anthracite coal, which was heavily mined throughout the 19th and early 20th centuries. The industrial, institutional, and practical modernization of the United States was contingent on the labor and the lives both lived and lost in the Anthracite Coal Region. Originally inhabited by the Delaware and Susquehannock nations, the first anthracite coal was discovered in the mid-18th century and the first mine established in 1775 near Pittston, Pennsylvania. By the 1820s, coal was being shipped in large quantities out of the region. The population rapidly grew following the American Civil War, with the expansion of the mining and railroad industries. English, Welsh, Irish and German immigrants formed a large portion of this increase, followed by Polish, Slovak, Ruthenian, Ukrainian, Hungarian, Italian, Russian and Lithuanian immigrants. The influence of these immigrant populations is still strongly felt in the region, with various towns possessing pronounced ethnic characters and cuisine. The anthracite mining industry loomed over the region until its decline in the 1950s. Strip mines and fires, most notably in Centralia remain visible. Several violent incidences in the history of the U.S. labor movement occurred within the coal region as this was the location of the Lattimer Massacre and the home of the Molly Maguires. This guide is intended to help tie together what are often elusive resources when researching the history of the Anthracite region of Northeastern Pennsylvania. It is a work-in-progress and far from complete. Suggestions about additional sources are always welcome and new links will be added frequently.